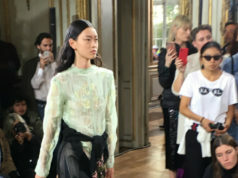 Gaultier, Dior, Chanel, Armani, and more – in short, la crème de la crème – all turned out for Spring 2019 Haute Couture Fashion Week in Paris last week. The most buzzed-about spectacle thus far has been the Dior show, which was held in – of all things – a circus tent. Models like Karlie Kloss entered the striped circus tent to see for themselves what all the fuss was about. On the Dior runway, circus tumblers moved deftly and impressively, as models swirled around them gracefully modeling the looks for the spring season. Fittingly, looks you might see at a circus – albeit a remarkably glamorous and chic one – could be found on the models. Tulles, sequins, bowties, and fitted caps were worn by stone-faced models who did the clothes justice. Dior’s first female designer, Maria Grazia Chiuri, helmed the show with bold creativity, and the buzz surrounding the show speaks to her efforts and drive. But the fun and wild looks weren’t solely found at Dior – many fashion houses showing their haute couture designs took the fashion set on a wild ride, that yielded crazy, exciting, wild looks. Viktor & Rolf’s standout was a puffy purple dress that looked like the tooth fairy might wear it. In large, capital letters, printed on the dress read: “Sorry I’m Late I Didn’t Want to Come.” Another bold, direct statement found on a V&R dress was on an even puffier white one, which read: “I’m Not Shy, I Just Don’t Like You.” The label can be commended for their honesty and humor – proving, unlike what some think, that fashion doesn’t take itself all that seriously. Celebrities were, of course, out in full force. 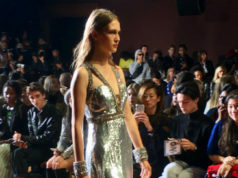 Fashion icon and “living legend” Naomi Campbell was spotted among the PFW festivities, as both a model and an onlooker. Campbell closed the Valentino show; this was her first return to the Armani catwalk in 14 years, reports People magazine. Also at the Valentino show was Canadian songbird Celine Dion, who looked spring-ready in a light, beige top and glittery green earrings. Dakota Fanning was also in attendance, wearing a lovely blush rose-colored dress. Mother-daughter pair Maya Hawk and Uma Thurman sat front row, of course. Meanwhile, over at the Chanel show, Kristen Stewart could be found wearing a blazer and shiny pants, with 1960s-style huge, colored sunglasses. Continuing her hippie vibe, Kristen threw up a peace sign, captured by photographers nearby. Cindy Crawford’s daughter, Kaia Gerber (who is also a model), took to the runway for the show, following in her mother’s footsteps. One notable figure was missing from Paris Fashion Week, though. Karl Lagerfeld missed the Chanel show, to the shock of many. Lagerfeld’s name is practically synonymous with Chanel and has been for years (he has designed for Chanel since 1983). 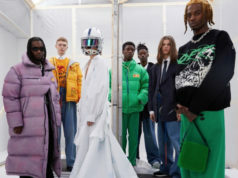 The company attributed his absence to Lagerfeld feeling “tired.” Virginie Viard, Lagerfeld’s studio director, acted as a stand-in for him at the show. Chanel, a fashion house almost as French as France itself, was well-attended and the show brought the looks, too. Models marched around a swimming pool, wearing dresses in spring-y colors – ballet pinks, whites, robin egg blues, and of course, Parisian’s favorite color – black. Big, puffy dresses and Chanel’s classic blazer could all be found, too. The show delivered exactly what one hopes Chanel will deliver – exciting, intoxicating looks that have you eagerly awaiting spring’s arrival, so you can test drive the styles yourself. The Chanel Spring 2019 Haute Couture show closed with an ornate, jeweled swimsuit, which I can’t imagine anyone actually wearing for swimming (for a party, though – perhaps). Nonetheless, the shiny, glimmering bathing suit – complete with a jeweled swim cap and veil – elevated the show and took it to that place that only fashion can: Magical, aspirational inspiration.